How to develop Allah’s love? Love is a spontaneous condition. It is an unintentional state. You have no voluntary control over its origin. However, there are some voluntary acts that may lead to the creation of a strong relationship with Allah. It is well established by the experience of masters of Tasawwuf that when practiced appropriately they do lead to creation of Allah’s love (muhabbat). At the same time reflecting about our attitude in regards to them. All these are to be carried out simultaneously. This will, inshaAllah, create a strong bond between the slave (abd) and his Master (Allah). This bond/relationship/love is the objective of our path. It is the driving soul for true observance of Shariah. We may set an imaginary expected standard for this love. 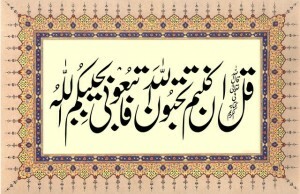 For example, Sheikh Abdul Qadir Jilani or Khawajah Moinuddin Chisti ra’s state of love for Allah swt. And when this not happen within our expected short time frame, we feel at loss. This is inappropriate. This is the path (tareeq) of slave hood (abdiyat). Our under-par desires and immature wishes have no standing in this path. They have to be annihilated (fana). After implementing these acts correctly, a strong relationship with Allah swt will certainly develop, accordingly to our state. It will inshaAllah develop over time and become ingrained in us. We will, inshaAllah, discuss each of these actions separately in detail.